Watch how Friday morning's announcement of Collingwood's new partnership with Holden unfolded on CTV. Collingwood Football Club and Holden have joined forces, bringing together two of the most respected brands in Australia.A three year, multi-million dollar partnership will see Holden become a Platinum Partner of the Collingwood Football Club and official sponsor of Nathan Buckley and his team of coaches, one of the club's highest profile properties. Collingwood President Eddie McGuire addresses those gathered at the announcement of Collingwood's new partnership with Holden on Friday. There is no question the club has big ambitions over the next few years both on and off the field, and Holden will now become and key part of that strategy moving forward. Collingwood Football Club and Holden have joined forces, bringing together two of the most respected brands in Australia. A three year, multi-million dollar partnership will see Holden become a Platinum Partner of the Collingwood Football Club and official sponsor of Nathan Buckley and his team of coaches, one of the club’s highest profile properties. Collingwood Chief Executive Gary Pert said: ‘’ The opportunity to combine two iconic Australian brands has enormous possibilities. While each organisation has great heritage and tradition, they are also both committed to innovation and excellence which is why I see this as one of the most exciting partnership decisions the club has made in recent times. Holden Chairman and Managing Director, Mike Devereux , said the two organisations possess rich histories and share many traits. “Our partnership with Collingwood is a natural fit. Both Holden and Collingwood are iconic Australian brands and come from strong foundations enriched in Aussie culture, supported by fans that have a real passion for these brands,” Devereux said. 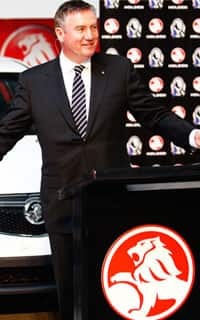 Holden re-enters the AFL football sponsorship market for the first time in 15 years and Pert said it was both fitting and a compliment that Holden should choose to ‘get back into the game’ with the Magpies. “The Collingwood Football Club sees wonderful potential for both organisations in this relationship. In 2012, we drew an average crowd of 60,000 to our home matches and, on average, more than 1 million people each week watched Collingwood matches on television. This year we will march towards our goal of 80,000 members. Holden’s sponsorship of our coaches will give them exposure and access to arguably the best and highest profile coaching leadership team in the AFL’’, Pert said.